Symbolism, in painting, is more a philosophy than an artistic movement. Its cultists differ between them, but they all use a visual language related to their own dreamy imaginary. So the symbol is not used as a convention, but it is more subjective and personal. 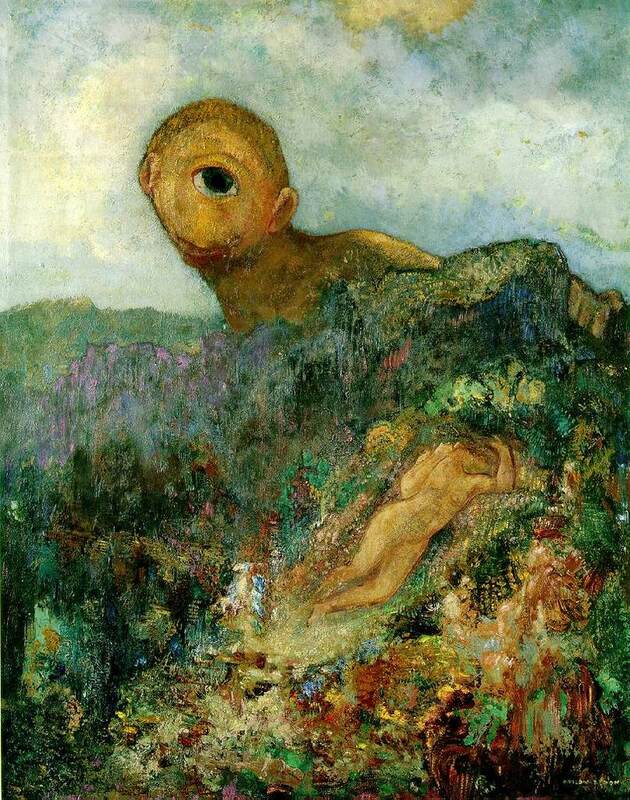 Odilon Redon, as one of the key figures in the movement, had an amazing creative flexibility. Along his work, we can see completely different motifs: still lives, landscapes, monsters, religious scenes, portraits and mythological figures; but, all of them, common to the symbolists. In Redon’s painting, particularly, we can highlight the use of bright colors, confuse compositions and heterogeneous color fields. One of the many mythological creatures he used was the cyclops, who appears staring from behind to a naked woman resting over the grass. Both characters keep a coherent form, with dull colors; compared to the colorful and confuse environment that surrounds them. Although we cannot know the meaning of the work (if it has any), it is important to know that, in the same year of the painting, Ari, the artist’s son, was recruited by the army to fight in the First World War. Knowing this, Cyclops could be interpreted as the defenselessness before a danger. The woman before the cyclops or Ari before the war. ~ by Álvaro Mazzino on February 24, 2011. It brings out the color and all the sunshine in your skin and hair. It’ll actually look great with your bronze make-up, too. Don’t tell me you haven’t been addicted to all things bronze. According to SneakerNews, the Off-White x Air Jordan 3s will be dropping sometime in May so expect them to be revealed sooner than later. This entry was posted on February 24, 2011 at 10:52 and is filed under Symbolism.You can follow any responses to this entry through the RSS 2.0 feed.You can leave a response, or trackback from your own site.